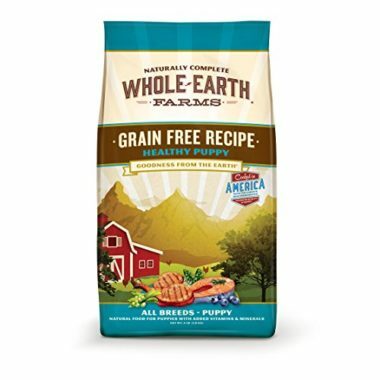 Whole Earth Farms is one of those brands of dog food that offers high quality proteins plus a blend of healthier carbs sans allergenic grains like wheat, corn, and soy. It doesn’t use artificial preservatives and colors in its formulations. It doesn’t use byproducts in its formulations as well. That is why a lot of pet parents look up to the brand for naturally nutritious pet food that utilizes the goodness of Mother Nature’s bounty at a price that is not really that too steep. In this Whole Earth Farms dog food review we’ll see just how well-balanced the nutrient profile of 5 of the brand’s bestsellers and check whether you should consider giving your pet Whole Earth Farms dog food, too. It’s perfectly understandable why many pet parents are so upbeat about this Whole Earth Farms grain free dog food formulation featuring an exciting blend of pork, beef, lamb, and salmon mixed with healthy veggies like potatoes, sweet potatoes, and peas. It’s like getting the best ingredients from Mother Nature’s own bounty basket and cramming everything into bite-sized kibbles that hounds love. This Whole Earth dog food formula provides an interesting array of vitamins, minerals, and nutraceuticals as well as several strains of beneficial bacteria to aid in the better digestion and absorption of nutrients. Not a single molecule of health-giving micronutrients is ever wasted with the special dry dog food formulation, ensuring your pet will continue to thrive to its fullest potential. If you’re having a really difficult time caring for your pudgy pooch you might want to consider giving it the Healthy Weight formulation of Whole Earth Farms dog food. Made with the leanest proteins from chicken, this reduced-fat dry dog food is perfect for pets that are prone to develop canine obesity or those that are leading a very sedentary lifestyle. The calories are just enough to make sure your dog still has plenty of energy to feel very much alive while the B-vitamins in this Whole Earth Farms grain free formula are sure to get your dog’s metabolism up and running. 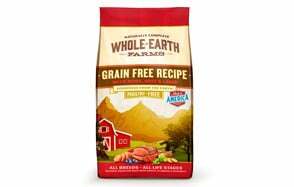 Its grain free recipe is also perfect for dogs that may have gluten allergies. Plus, the addition of prebiotics and probiotics can surely aid in the more efficient digestion and absorption of nutrients. 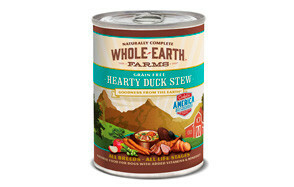 Giving your pet this Whole Earth Farms canned dog food is like giving it one of Mother Nature’s best foods – duck. 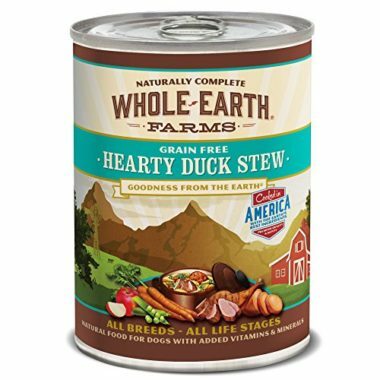 Featuring a rich blend of duck meat and chicken liver in a delicious turkey and chicken broth mixed with peas, carrots, egg, and sweet potatoes, this Whole Earth Farms wet dog food is nothing less than a meal that’s bursting with flavors and complete nutrition. There are botanicals added that serve as natural preservatives while also improving the overall nutrient profile of the formulation. Give it as a complete meal or as a topper for your hound’s favorite kibble. Regardless of how you’re going to feed your pet with this Hearty Duck Stew, it will definitely thank you for it. For man’s youngest best friend, the Whole Earth Farms puppy food featuring a rich blend of protein-rich chicken and healthy carbs like barley, oatmeal, and brown rice is a sure-fire hit to the youngest member of your growing canine family. The addition of salmon into the mix helps provide the DHA and EPA that young dogs need for optimum eye and brain development as well as the more successful maturation of their immune system. Like all Whole Earth Farms dog food formulation, the Puppy Recipe also comes with probiotics laying the good foundation for your young hound’s digestive system. It’s also a great way to enhance its immune system, making your pup highly resistant against infections that are very common in puppies. The Puppy Recipe is always a good choice when transitioning your pet from its mother’s milk to dry dog food. 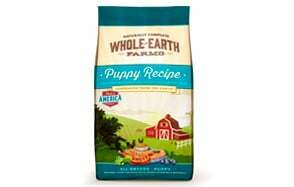 A thoughtful puppy recipe, this Whole Earth puppy food takes into consideration the various nutrient requirements of growing puppies as they go through the various stages of the first year of life. Still featuring lean chicken as its principal source of proteins, the Health Puppy also comes with DHA- and EPA- rich salmon. This helps ensure your young canine friend will have all the right nutrients it needs to develop its brain and eyesight while also ensuring that its bones, joints, and muscles will develop to their fullest. The protein content may not be as high as some other puppy food brands, but this Whole Earth Farms puppy food has more than enough easily digestible proteins to ensure optimum growth and development in your young canine. Whole Earth Farms is a brand of pet food that is exclusively formulated and produced by Merrick Pet Care. The company has been around since 1988. Founded by Garth Merrick, the company believed in formulating the best food ever for man’s best friend. Merrick Pet Care dedicated its existence to the formulation of wholesome and highly nutritious recipes that modern pets truly deserve. The company is based in Hereford, Texas and has been producing some of the world’s premiere dog food known for its high quality ingredients, non-inclusion of allergenic grains, and the non-use of artificial ingredients. As a brand, Whole Earth Farms follows in the tradition of Merrick, utilizing only the best possible ingredients in their formulations. They are best known for the catch-phrase “goodness from the earth” highlighting the brand’s insistence on using only premium quality ingredients sourced from reputable farmers and suppliers. Whole Earth Farms dog foods contain no corn, wheat, soy, byproducts, artificial preservatives, and artificial colorings. The formulas are designed for easier digestibility while adhering to the nutrient requirements for dog as stipulated by the guidelines of AAFCO. Sadly, there has been a massive exodus of loyal Whole Erath Farms consumers because of the buyout of the company by Nestle Purina PetCare in September 2015. Pet parents are growing concerned about the reduction in the quality of Merrick’s pet products because of the acquisition by Nestle. The pet food arm of the Swiss conglomerate has been embroiled in countless negative consumer complaints stemming from the company’s extensive use of empty calories as fillers and the emphasis on the use of plant proteins as a cheaper alternative to higher quality but more expensive animal-based proteins. The buyout has created mass furor despite assurances from Merrick that they will continue to manufacture pet food products in the same way as they have for many years. 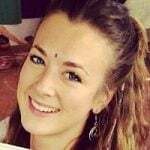 This is despite having been bought by one of the world’s largest consumer products company. A quick look at some of the Whole Earth Farms dog food review articles indicates an overall reduction in the level of confidence of pet parents who have been using Merrick and Whole Earth Farms products for many years. 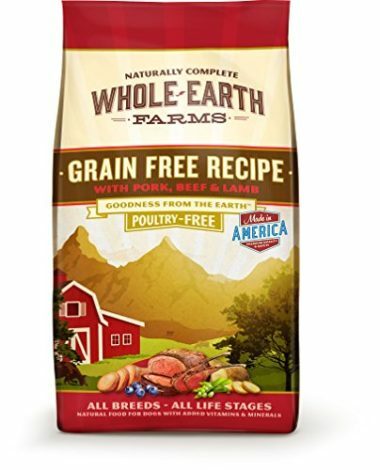 Pet parents who prefer a brand of dog food that doesn’t include wheat gluten, corn, and soy in their formulation will surely appreciate Whole Earth Farms. Instead of using these allergenic grains, the brand utilizes sweet potatoes, peas, brown rice, oatmeal, and potatoes to provide pets with the energy they need, the fiber for healthier digestion, and micronutrients for optimum development and growth. Dog lovers who strongly believe that dogs deserve high quality meats as their main source of proteins will also love Whole Earth Farms. The brand not only puts emphasis on animal-based proteins, it also makes sure that byproducts have no place in their recipes. While some experts actually recommend putting animal byproducts in dog food as sources of other nutrients like chondroitin and glucosamine, there are pet parents who find giving dogs parts of an animal other than its meat to be especially repulsive. The brand also utilizes all-natural ingredients in each recipe. This should appeal to pet parents who are wary of artificial ingredients found in many dog food products today. Many commercially available pet foods are laced with artificial flavorings, preservatives, and even colorings that may adversely affect the overall health of dogs. Pet parents who would like to see an enhancement of their dogs’ digestive functions can also rely on the dry dog food formulations of Whole Earth Farms. The company always includes 4 strains of gut-friendly probiotic organisms into their dry dog food formulation. This not only helps improve dogs’ digestion, it also supports a healthier immune system. The true measure of quality of any dog food product is in its ingredients. This is regardless of how aggressive the marketing campaign of the company is. More and more pet parents are looking into the ingredients and making careful computations as to the actual composition of these nutrients. 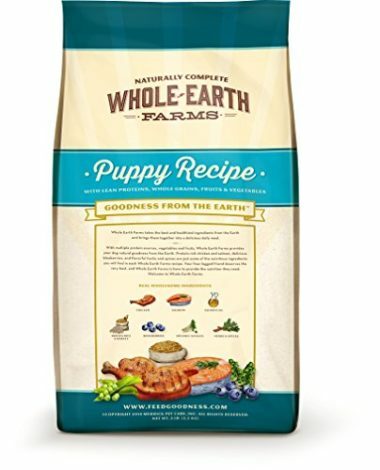 In this section, we’ll try to analyze the ingredients of Whole Earth Farms dog food products. The dry dog food formula of Whole Earth Farms dog food contains about 25.5% protein on average. When the 11% moisture has been taken into consideration, the resulting dry matter basis for protein jumps to about 28.6%. While this is higher than the minimum AAFCO recommendation for proteins in dogs, it is still lower than other brands that typically come with protein content in the low-30s to mid-30s range with a dry matter basis rating of about 35 to 40 percent. Even the Whole Earth Farms canned dog food doesn’t really offer that much protein compared to other brands. The crude protein for wet food is only 8%, recomputed at 42% when moisture has been compensated. Again, other wet dog food brands can provide as much as 55% proteins as dry matter. Perhaps the more telling of all is that there are an unusual number of plant-based proteins like peas and potatoes. What this possibly means is that the proteins as reflected in the guaranteed analysis don’t come only from animal sources but also from plant sources. Unfortunately, there is no credible information as to how much proteins are sourced from animals and how much are sourced from plants in each formulation of the dog food. One can only guess that this shift to plant-based proteins is part of the change in company ownership with Nestle Purina being well-known for using fillers and cheap ingredients in their formulations. At the very least, the brand still manages to put animal proteins as its first and most important ingredient. 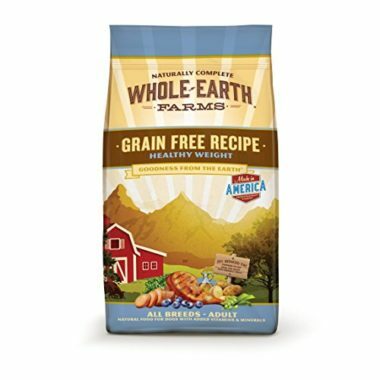 On the positive note, the crude fat content of Whole Earth Farms dog food products is lower than most brands at only 11.25% or 12.6% when moisture content is removed from the computation. Sadly, this only bolsters the suspicion that there are less animal ingredients in these formulas. Animal meats already contain fat. That is why if there are more animal ingredients in a certain formula, one can also expect the fat content to be at least in the mid-10s or near-20s. The only other ingredients used in the formula are vegetables, grains, and lentils which do not really contain fat. It looks like there is valid reason to believe that Whole Earth Farms is already reducing the quality of its pet food products. The brand is commendable for not using corn, soy, and wheat in their formulas. It also uses a variety of healthier carbs that are rich in fiber, vitamins, and minerals. Potatoes, peas, sweet potatoes, barley, brown rice, and oatmeal are just some of the sources of carbohydrates that the brand includes in their formulas. Sadly, potatoes are known to be high glycemic foods so we’re not really sure if it’s a good idea to give to a dog that is diabetic. The brand complies and exceeds the minimum requirements of AAFCO for the micronutrients needed by dogs across a variety of life stages. Vitamins and minerals are sourced primarily from the high quality meat products used in the formulation. These are typically supplemented by the vitamins and minerals coming from fruits and vegetables that form the carbs of the formula. A lot of pet parents love Whole Earth Farms dog food products for their respective hounds. Unfortunately, ever since the brand was bought by Nestle Purina PetCare in 2015, there is a growing concern over the quality of its dog food owing to the less-than-remarkable nutrient profile of Purina pet food products that are literally rich in fillers. This is the kind of dog food that has an incredible journey in the pet food market, but whose integrity is now being questioned because of its being acquired by a giant.